The Planning Commission meeting resulted in a 4-1 vote advancing the Vallco Specific Plan. It is possible that we may be in the final days of deliberation after decades of conversation. 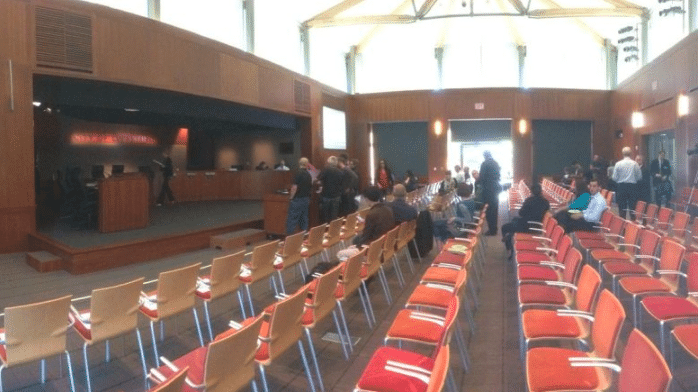 Last night’s Cupertino Planning Commission meeting advanced the Vallco Specific Plan, the result of a months-long community process headed by the design firm Opticos, to fix up the now virtually empty and dead Vallco mall. This plan is intended to be the City’s preference to turn Vallco into something new and beneficial to the community. It is different from Sand Hill Property Company’s SB35 Vallco Town Center project released earlier this year. The Planning Commission meeting resulted in a 4-1 vote, with Commissioner Jerry Liu breaking from the majority. However, Moulds also cautioned the Commission against additional requirements, saying the plan was “on the razor’s edge of viability,” and between this and the SB35 project, “it’s a coin flip.” He further confirmed that the SB35 project will move forward until the Specific Plan has received all necessary approvals. The Specific Plan contains three variations on housing-to-office ratios, and provides both below-market and market-rate housing options in all variations. The first tier is a lower intensity development with 35 dwelling units an acre, maximum commercial development and no community benefits. The second tier is more housing centric with up to 52.5 dwelling units an acre, and would provide community benefits such as a new City Hall at the Civic Center Plaza and contributions to traffic demand management. An additional option was newly presented by the Planning Commission during Tuesday night’s meeting, which allocated 52.5 dwelling units an acre of housing and less than 1.5 million square feet of office. The Specific Plan is an alternative to Sand Hill Property Company’s Vallco Town Center plan, which was found in June to be compliant for streamlining eligibility under the requirements of State Law SB35. The SB35 plan features 2,402 housing units, half of which will be set aside as affordable housing, 1.8 million square feet of office, a 30-acre green roof and 400,000 square feet of retail. The Planning Commission’s more than six-hour review, discussion and comment on the plan covered a wide range of topics and views from the community. At the end, the majority of the Commission complimented the staff’s work on the plan and forwarded it with recommendations to the City Council. The Council’s deliberation of the plan is set for Tuesday, Sept. 18 at 5 p.m.
Be the first to comment on "Vallco Specific Plan advances to Council with Planning Commission recommendation"